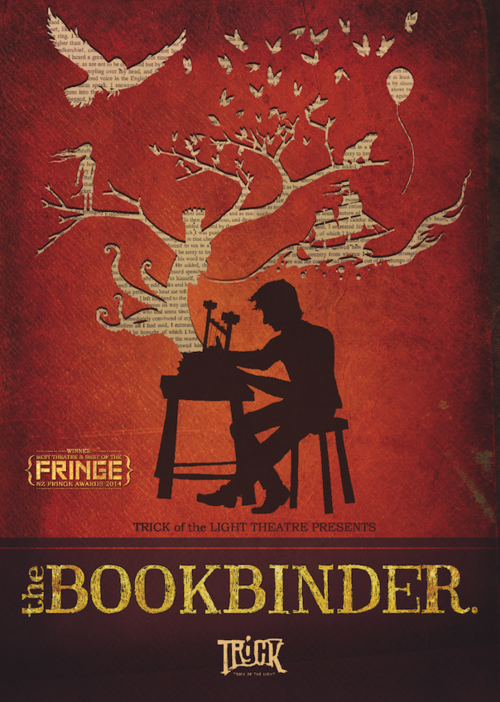 Drawing to its close, does 2014 have any more treats or presents to bestow beyond the return of the Mystery Book Artist of Edinburgh and the debut of “The Bookbinder” from New Zealand’s Trick of the Light Theatre? of the Riddles Court sculpture in progress, echoing serendipitously “The Bookbinder”, a performance piece on the other side and bottom half of the globe by Trick of the Light Theatre this year. Written and performed by Ralph McCubbin Howell, directed by Hannah Smith, with music by Tane Upjohn Beatson, “The Bookbinder” incorporates book sculpture as pop-up book theater and was first performed at Arty Bees Bookshop during the New Zealand Fringe Festival 2014. What a pleasure and gift that would be to find the MBAE and “The Bookbinder” in a common festival. 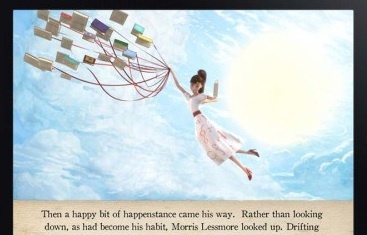 If holiday wish lists are allowed, let’s add to it Moonbot Studios, home of The Fantastic Flying Books of Mr. Morris Lessmore.